For the Church, the global judgment, namely the rendering of justice towards all at the Second Coming of our Lord, is not only an eschatological event, but also a reality which is experienced in our lives, and especially in the hearts of her faithful members. In the Symbol of Faith, which we recite daily, we confess and proclaim regarding the Savior Christ: "And He shall come in glory to judge the living and the dead, whose reign shall have no end." And every time the mystery of the Divine Eucharist is performed, we remember the events of our salvation, the Cross, the Passion, the Resurrection and the Ascension of the Master Christ, as well as His Second Coming. "Remembering, therefore, this saving commandment and all that has been done for our sake: the Cross, the Tomb, the Resurrection on the third day, the Ascension into heaven, the enthronement at the right hand, and the second and glorious coming again." "For all things, for the most part, are twofold in our Lord Jesus Christ. A twofold generation: one of God before the ages, and one of a Virgin at the close of the ages. His descents twofold: one the unobserved like rain on a fleece, and a second His open coming which is to be. In His former coming He was wrapped in swaddling clothes in the manger, in His second He covers Himself with light as with a garment. In His first coming He endured the Cross despising shame, in His second He comes attended by a host of Angels receiving glory. We rest not then upon His first coming only, but look also for His second. And as at His first coming we said, 'Blessed is He that comes in the Name of the Lord,' so will we repeat the same at His second coming, that when with Angels we meet our Master, we may worship Him and say, 'Blessed is He that comes in the Name of the Lord.' The Savior comes, not to be judged again, but to judge them who judged Him. He who before held His peace when judged, shall remind the transgressors who did those daring deeds at the Cross, and shall say, 'These things have you done, and I kept silence.' Then, He came because of a divine dispensation, teaching men with persuasion; but this time they will of necessity have Him for their King, even though they wish it not." "I will send My messenger, who will prepare the way before Me. Then suddenly the Lord you are seeking will come to His temple; the messenger of the covenant, whom you desire, will come," says the Lord Almighty. "Our God comes and will not be silent; a fire devours before Him, and around Him a tempest rages. He summons the heavens above, and the earth, that He may judge His people: 'Gather to me this consecrated people, who made a covenant with Me by sacrifice.' And the heavens proclaim His righteousness, for He is a God of justice." The Apostle Paul speaks of this: "The work of each will become manifest, because the Day will bring it to light. It will be revealed with fire, and the fire will test the quality of each person's work." "Then shall Angelic trumpets sound; the dead in Christ shall rise first - the godly persons who are alive shall be caught up in the clouds, receiving as the reward of their labors superhuman honor, inasmuch as theirs was a superhuman struggle." Paul the Apostle to the Nations stresses the same thing in his first epistle to the Thessalonians: "For the Lord Himself will come down from heaven, with a loud command, with the voice of the archangel and with the trumpet call of God, and the dead in Christ will rise first. After that, we who are still alive and are left will be caught up together with them in the clouds to meet the Lord in the air. And so we will be with the Lord forever." Second, the Gospel passage about the Judgment not only highlights the universality of the Judgment, but it also specifies the criteria, namely the measure of the judgment, which is love. It is the universal law of humanity, which does not exclude anyone. Particularly for Christians it is the thermometer of their faith. It refers to simple every day things, which can be applied by all people everywhere and always. Hunger, thirst, nakedness, sickness and prison one cannot overlook. No one is allowed, whether they reside in the realm and conduct of Christians or not, to ignore them. And mark how easy are His injunctions. He said not, "I was in prison, and you set me free; I was sick, and you raised me up again;" but, "you visited me," and, "you came to me." And neither in hunger is the thing commanded grievous. For no costly table did He seek, but what is needful only, and His necessary food, and He sought in a suppliant's garb, so that all things were enough to bring punishment on them; the easiness of the request, for it was bread; the pitiable character of Him that requests, for He was poor; the sympathy of nature, for He was a man; the desirableness of the promise, for He promised a kingdom; the fearfulness of the punishment, for He threatened hell. And yet, for the practical manifestation of love, neither wealth, nor power, nor education nor profession or age have a central role. From the most poor and weak to the most rich and strong there are opportunities to exercise love and offer help to the needy, whom Christ associates with His person: "Amen I say unto you, inasmuch as you do it to the least of My brethren, you do it to Me." "He sends those on the left into the fire which had been prepared for the devil. For as the demons are without compassion and are cruelly and maliciously disposed towards us, it is fitting that those who are of like mind with them, and who have been cursed by their own deeds, should merit the same punishment. See that God did not prepare the fire for men, nor did He make hell for us, but for the devil — I make myself liable to hell. Tremble, then, O man, and understand from this that these men were not punished as fornicators, or robbers, or perpetrators of any other vice, but for not having done good. Indeed, if you consider things well, the robber is he who has much and does not give alms, even if he does no obvious injury. For whatever he has in excess of his needs, he has stolen from those who are in need and who have not received anything from him. If he had shared these things with them, they would not be in need. Now that he has locked these things up and kept them for himself, for this very reason they are in need. So he who does not give alms is a robber, doing injustice to all those whom he could have helped but did not, and for this reason he and those like him shall go away into eternal punishment which never ends; but the righteous shall enter into eternal life." This passage, with its wondrous reminders and interpretations from the God-bearing Fathers, reminds us also of something very big and at the same time shocking. And this is the Christocentric dimension the commandment of love takes. Whatever is done for the least of the brethren, is done to the person of Christ and for the person of Christ. So, our great encounter with Him in this life which we desire as Christians, happens through our brethren in Christ. "But now even in the presence of the world, and at the appearing of that unspeakable glory, He proclaims and crowns you, and acknowledges you as His sustainer and host, and is not ashamed of saying such things, that He may make the crown brighter for you. So for this cause, while the one are punished justly, the others are crowned by grace. For though they had done ten thousand things, the munificence were of grace, that in return for services so small and cheap, such a heaven, and a kingdom, and so great honor, should be given them." Therefore, anyone who fails to live this sacrificial offering directly and practically, will find themselves deprived of the love of God, and will be without the presence of His grace. And my hell does not become other people, but it is myself, from the moment I stop loving, offering, serving, girded with the towel of humility, and in this way I will experience the fire of hell before I leave this world. Therefore, my brethren, "knowing the commandments of the Lord, let us conduct ourselves accordingly, feeding the hungry, giving drink to the thirsty, clothing the naked, gathering in the strangers, visiting the sick and those in prison, that the future Judge of all the earth may say to us: Come blessed of My Father, inherit the Kingdom prepared for you." 1. John Chrysostom, Homily 79 on Matthew. 2. Cyril of Jerusalem, Catechetical Homily 15. 3. Divine Liturgy of Saint John Chrysostom. 4. Cyril of Jerusalem, Catechetical Homily 15. 8. 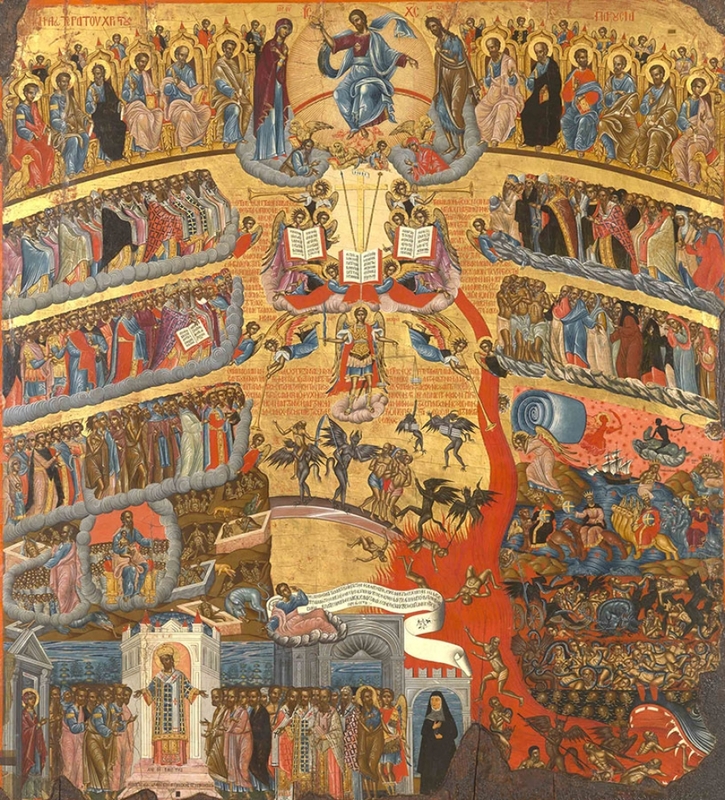 Matins Praises for the Sunday of the Last Judgment. 9. Cyril of Jerusalem, Catechetical Homily 15. 11. John Chrysostom, Homily 79 on Matthew. 13. Theophylact of Bulgaria, Commentary on Matthew 25. 14. John Chrysostom, Homily 79 on Matthew. 15. Gregory the Theologian, Oration 14. 16. Vespers Idiomelon of the Liti for the Sunday of the Last Judgment.